MADISON -- West Nile virus was detected in three of 16 ruffed grouse that were found sick or dead and submitted by the public to the Wisconsin Department of Natural Resource for testing from October through December 2018. At this time, there is no evidence to confirm that West Nile virus or any other factor is having population-level impacts on ruffed grouse in Wisconsin. Ruffed grouse populations are known to rise and fall over a nine- to 11-year cycle, so declines are not unexpected, though the 2017 decline occurred before the cycle would typically predict. Of these 16 birds, 10 were negative for any viral infection, three were positive for Eastern Equine Encephalitis virus, one was positive for WNV and two were positive for both EEEV and WNV. Of the six birds that tested positive for EEEV or WNV, three showed signs of clinical disease, which may or may not have eventually resulted in death. These results are preliminary, and 238 hunter-harvested grouse samples remain to be tested from the first year of a three-year study of WNV in ruffed grouse across Wisconsin, Minnesota and Michigan. Preliminary results for year one of this regional exposure study are tentatively anticipated to be available in mid-2019. Ultimately, the timeline for results will depend on the number of samples submitted by each state and the extent to which follow-up testing is required to differentiate between WNV or other similar viruses. Anyone who finds a sick or dead ruffed grouse is encouraged to submit its carcass for disease sampling -- sick or dead ruffed grouse carcasses can be submitted at any time. Observations can be also reported to local DNR Wildlife Management staff. In addition to sick or dead submitted samples, DNR staff distributed 500 self-sampling kits to grouse hunters statewide with assistance from the Ruffed Grouse Society and the Wisconsin Conservation Congress as part of a multi-year regional study [PDF] with Minnesota and Michigan. Both WNV and EEEV are mosquito-borne viruses that can affect humans, horses and certain species of birds. Clinical signs of WNV in birds are indistinguishable from those of EEEV and can include tremors, weakness and loss of coordination. 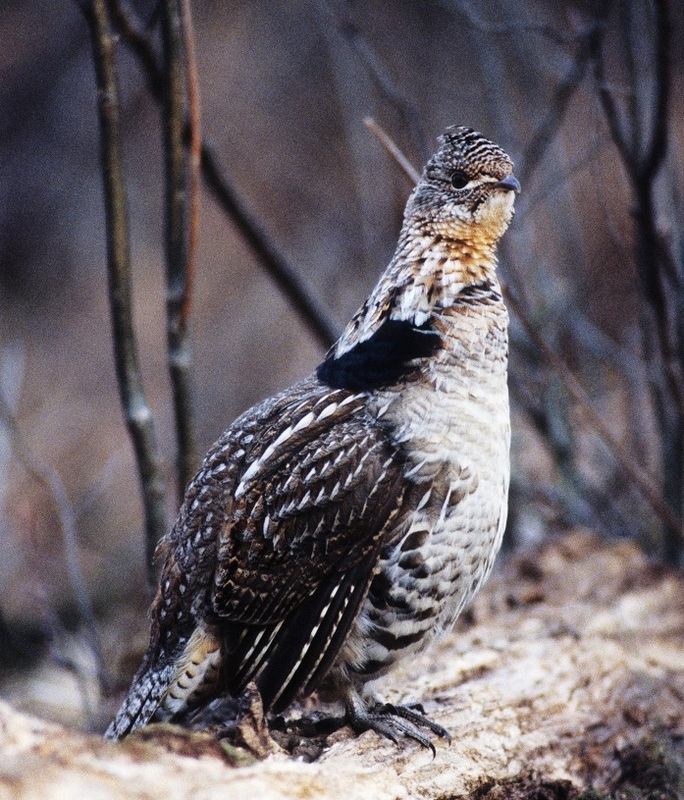 WNV was first detected in the state in 2002 but only now has been detected in ruffed grouse. EEEV is considered a native virus and was first detected in Wisconsin's grouse population in the late 1950s. This historical information suggests that the likelihood of EEEV having population-level impacts on grouse is low. State wildlife officials say continued focus on habitat management for ruffed grouse is the best method to mitigate potential disease impacts on the population. Ruffed grouse are a short-lived species with only 30 percent of the average adult population surviving year to year. The Great Lakes region contains some of the most extensive early-successional forest habitat and healthiest ruffed grouse populations in the nation. DNR staff are currently working with partners to develop a long-term management strategy for ruffed grouse in Wisconsin. For more information on ruffed grouse management and disease sampling, search the DNR website, dnr.wi.gov, for "ruffed grouse management." OSHKOSH, Wis. - The public can learn more about the status of the lake sturgeon population in the Winnebago System at three upcoming public meetings. Wisconsin Department of Natural Resources staff will share results from a recent survey of 2,000 sturgeon spearing license holders and discuss how these results were used to help draft a rule proposal to define the parameters of a sturgeon spear. Meetings will also include a question and answer session to provide sturgeon enthusiasts with an opportunity to pose any questions they may have regarding sturgeon management on the Winnebago System. Wednesday, Jan. 23, North Fond du Lac - Horace Mann High School Auditorium, 325 McKinley St.
Tuesday, Jan. 29, Chilton - Engler Center for the Performing Arts, 530 W Main St.
Thursday, Jan. 31, Menasha - Menasha High School Auditorium, 420 Seventh St.
For more information regarding sturgeon management, contact Ryan Koenigs, DNR Lake Winnebago sturgeon biologist,or learn more by searching the DNR website, dnr.wi.gov, for keyword "sturgeon management." MADISON - Time is running out to meet a Feb. 1, 2019, deadline to apply for nearly $4 million in grant funding for surface water management. The grants are awarded to local units of government, lake and river organizations and nonprofit organizations to support efforts to protect or improve water quality and aquatic habitat and manage aquatic invasive species. The surface water management grant program supports a broad range of activities, including projects to reduce runoff and nutrient enrichment, land acquisition for environmental protection, shoreline protection and restoration, wetland restoration and the implementation of management plans. Awards range from $10,000 to $200,000 per project and require a local contribution, or cost share, of 25-33 percent. Applicants have been working with their local biologists to develop projects in preparation for the 2019 competitive grant cycle. This cycle also includes Healthy Lakes grants available to shoreline homeowners who are interested in conducting an improvement project on their property. The program provides up to $1,000 in state funding for one of five best management practices included in the application. If rain gardens, runoff diversion and infiltration, fish habitat or shoreline native plantings would improve a lake property, shoreline homeowners should consider working with their lake association to apply for a Healthy Lakes Project. Those interested in applying for a management or control grant, can find more information by searching the DNR website, dnr.wi.gov, for keyword "grants," and clicking on the button for find a grant and clicking the link for "surface water grants." Additionally, regional DNR Aquatic Iinvasive Species coordinators can help develop a project for a waterbody and answer questions. MADISON- Cities, villages, towns, counties, regional planning commissions, tribal governments and special purpose lake, sewage, or sanitary districts have until April 15, 2019 to submit applications for funding to help reduce urban nonpoint source pollution and help manage storm water. The Wisconsin Department of Natural Resources is accepting grant applications for the Urban Nonpoint Source and Storm Water Management Planning grant program. The local government must have either jurisdiction over the project area or be required to control storm water discharge with an inter-governmental agreement between the municipality and the DNR. For planning projects beginning in 2020, the application postmark deadline for Urban Nonpoint Source and Storm Water Grant materials is April 15. Urban Nonpoint Source Construction grant applications will not be solicited in 2019 but will be solicited again in 2020. Parties interested in applying can learn more about the application process by searching the DNR website, dnr.wi.gov, for keyword "grants," and then click on the button for "find grants" and scroll down to the link for Urban Nonpoint Source and Storm Water Management Grant Program. The web page also has contact information for these programs. A webinar for this grant program is scheduled on Feb. 25, noon to 1:30 p.m. The webinar provides an overview of the Urban Nonpoint Source and Storm Water Management Planning Grant Program, with focus on the application process for funding projects to begin in 2020. The webinar offers an overview of what's changed since the last grant cycle, reviews what makes a good planning project (eligibility criteria and project attributes) and gives tips on writing a strong application. Click on attendee.gotowebinar.com/register/2732131759905680387 (exit DNR) to register for the webinar, or paste the link into your browser window. MADISON - The inaugural Keep Wildlife Wild poster contest has officially begun - students currently participating in fourth through sixth grades are encouraged to submit a poster to the Department of Natural Resources. Wisconsin's Keep Wildlife Wild initiative began in 2014 with a focus on providing information about the natural behaviors of wild animals, tips on how to determine if a wild animal is truly orphaned and what to do if someone finds a wild animal in need of assistance. Dianne Robinson, a DNR wildlife biologist who co-chairs the Keep Wildlife Wild initiative, says, "We are excited to announce our first poster contest, which we plan to conduct annually, to offer Wisconsin students the opportunity to actively participate in the Keep Wildlife Wild initiative. We have a wide variety of materials on the Keep Wildlife Wild page of the DNR website, including a lesson plan and various handouts that students can use to help them create their poster." The contest began Jan. 2 and runs through Feb. 22, 2019. First, second and third-place finalists will be selected for each grade level by a panel of judges, and finalists will be announced the week of April 7, 2019 during the second-annual "Keep Wildlife Wild Week." The poster must contain the words "Keep Wildlife Wild 2019" and follow the theme of the Keep Wildlife Wild tagline: "A young wild animal's best chance for survival is with its mother!" Additional details about contest rules and submission procedures can be found by searching the DNR website, dnr.wi.gov, for keywords "Keep Wildlife Wild," and clicking on the link for "Keep Wildlife Wild 2019 poster contest." MADISON - A project to improve habitat for piping plovers in Douglas County may result in the "incidental taking" of a rare beetle under an authorization the Department of Natural Resources proposes to issue for the project. Incidental take refers to the unintentional loss of individual endangered or threatened animals or plants that does not put the overall population of the species at risk. The Piping Plover Habitat Improvement Project involves the placement of dredge material onto a beach in Allouez Bay to improve nesting and foraging habitat for the federally and state endangered piping plover (Charadrius melodus). Approximately 3.5 acres of piping plover foraging habitat and 4.5 acres of piping plover nesting habitat would be constructed as a result of this project. The presence of the state endangered hairy-necked tiger beetle (Cicindela hirticollis rhodensis) has been confirmed in the vicinity of the project site. DNR staff determined that the proposed project may result in the incidental taking of some beetles. By completing this project and maintaining the site over time, habitat for both the piping plover and the hairy-necked tiger beetle will be greatly increased in area and improved in quality. Department staff concluded that the proposed project will minimize the impacts to the species by adhering to conservation measures; is not likely to jeopardize the continued existence and recovery of the state population of the species or the whole plant-animal community of which it is a part; and has benefit to the public health, safety or welfare that justifies the action. The conservation measures to minimize the adverse effect on the endangered species will be incorporated into the proposed Incidental Take Authorization. Copies of the jeopardy assessment and background information on the hairy-necked tiger beetle are available by searching the DNR website for incidental take public notice or upon request from Rori Paloski (608-264-6040 or rori.paloski@wi.gov). The department is requesting comments from the public through February 14, 2019 regarding project-related impacts to the hairy-necked tiger beetle. Public comments should be sent to Rori Paloski, Wisconsin DNR, PO Box 7921, Madison, WI 53707-7921 or rori.paloski@wi.gov.